If this is Butte, Julia and I are midway through our road trip from Hell. Two weeks ago, we were in Knoxville, Tennessee for four days. Then we were home for two days before flying to Ogden, Utah for four days. We flew here from Ogden yesterday and we fly from here to Louisville, Kentucky tomorrow for another four days. If we look like deer in headlights, you now know why. We are living out of suitcases and smiling at lots of steely-eyed TSA agents as part of our ongoing effort to help the Forest Service. Specifically, we aim to put the Forest Service’s Forest Inventory and Analysis Program on as many radar screens as possible – news media, elected officials, forest policy wonks, collaborative groups, civic organizations and forest user groups and environmental activists of all stripes. Todd Morgan is here this morning and I am certain he will back my assertion that the FIA Program is the Gold Stand where impartial and well-footnoted data about forests and forestry are concerned. I have been a user of FIA data for most of the 33 years since I founded Evergreen Magazine in 1986, so I guess I should not have been surprised when, two years ago, I was asked to speak at FIA’s annual user conference in Portland, Oregon. You can find my remarks on our Evergreen website. Long story short, as Julia and I were leaving the Portland conference, our FIA hosts asked us we’d be interested in doing an investigative report designed to raise FIA’s nearly non-existent level of visibility. We did a similar outreach for the Forest Products Lab at Madison, Wisconsin in 2003 and it was a huge success, thanks in part to two tours we put together with the Montana Logging Association. We thus jumped at the opportunity to help FIA, though after spending four days in snowbound St. Paul, Minnesota last month, we began to question our sanity. We’ve already rolled out two initial essays we hope will help FIA find its way into the consciousness of all who fret about forests and wonder if there are any left. Both are posted on our website and I encourage you to read and share them with your email networks. The first essay is titled FIA: The Gold Standard, and the second it titled Ivan Doig Walked these Halls – the halls being the long and dimly lit hallways in the old Gus Solomon United States Courthouse in downtown Portland. The Forest Service’s Pacific Northwest Research Station is housed on the fourth floor as is FIA’s Portland research crew. I marvel at the whole idea that Ivan Doig, who was easily one of the last century’s finest writers, walked PNW’s halls several times two years before his autobiographical memoir, This House of Sky, was published. He did so in search of documents for two 1976 essays he wrote – one titled, Early Forestry Research: A History of the Pacific Northwest Range and Experiment Station and the second titled, The Beginning of the Forest Survey – the beginning being 1928, the year Congress passed the McNary-McSweeney Act, which put the Forest Service in the business of regularly surveying forest conditions in the United States. Doig, who grew up in the Sixteen Country about two hours from here, also wrote a fascinating article for a long-gone forestry magazine titled The Murky Annals of Clearcutting. I have copies of all three essays and re-read them periodically to remind myself that those who write about forests might someday write something with broader appeal that will make them rich. So far it hasn’t worked for me but hope springs eternal. I’m sorry to say that I never met Ivan Doig, but I did meet Norman Maclean and his boyhood friend, George Croonenberghs, who tied flies for the Maclean clan. Maclean and my great aunt both taught Shakespeare at the college level – he at the University of Chicago and she at Montana Western in Dillon. I have reason to believe they knew one another professionally and I hope to go to Dillion soon to see if her files contain any correspondence with him. As most of you no doubt know, Maclean wrote two really remarkable books – his autobiographical A River Runs Through It and Young Men and Fire, which was his attempt to explain the August 1949 Mann Gulch Fire that overran 12 of the Forest Service’s finest – smokejumpers from the then all new jump base at Missoula. Maclean died before he could finish his Mann Gulch epic, so his son, John, who is also a fine writer, completed the last few chapters. I am currently re-reading Young Men and Fire for the fourth or fifth time as part of my research for a book I’m writing titled First, Put Out the Fire. I know another book about the west’s wildfire pandemic seems like a colossal waste of time and effort, but I am hell-bent on explaining the roots of our crisis and what we can do to stuff the wildfire genie back in her bottle. My story isn’t the gripping tale that unfolds in Maclean’s Mann Gulch saga, but it is easily as tragic, and it is far more frustrating because I am forced to deal with people who don’t see anything wrong with the wildfires that are incinerating our future. With just a little luck, I should finish my draft manuscript by the end of June. Then the search for a publisher begins. So what do my meanderings about FIA, Maclean and Doig have to do with why I am here this morning? You can blame my friend Peter Kolb, who most if not all of you know and admire, for my being here. Peter has been one of my “go to guys” for many years. He sent me an email note two or three months ago hinting at the fact that Bruce might contact me, which he surely did about a month ago at SAF’s Leadership Conference on Coeur d’ Alene Lake. I was one of several who spoke in Coeur d’ Alene. Most in the audience were college students and aspiring foresters, so I decided to tell them the story of Evergreen because, so far as I know, ours is the longest continuously running forestry education program in the United States. Most of the timber industry’s big shots don’t believe forestry education works, so I long ago decided to go it alone – a decision I have never regretted despite the financial hardship that came with it. If you don’t remember anything else that I say in the next few minutes, remember this: If those of us who believe in the power of forestry don’t fill the public vacuum with the truth about forests and forestry, forestry’s detractors will, and there is a high probability that we won’t like what they have to say. Hence, my great admiration and appreciation for FIA’s magnificent work and for the wider body of knowledge housed on websites run by the Forest Service’s four research stations: Portland, Ogden, St. Paul and Knoxville. Likewise, my admiration for the world-class work that Todd Morgan and Peter Kolb do here in Montana. You are exceptionally fortunate to have them. Your conference theme – Montana’s Forests: Past, Present and Future – is a Ouija board if there ever was one. No matter the direction your presenters take, there will be important discoveries made. Because I am a journalist by profession, everything I know about Montana’s forests I have learned by asking stupid questions of very smart people. And because I am a storyteller at heart, I always try to turn the things smart people tell me into stories that ordinary mortals can understand and enjoy. Here’s an example of how this works. A few months ago, Peter emailed me some peer-reviewed research that had been done by another PhD scientist he knows. The topic was how forests in Montana have changed through time and the research involved pollen samples taken from bottoms of several lakes including tiny Foy Lake, which is about a mile from where I lived when I went to work for The Daily Interlake in Kalispell in 1967. As you might expect, the Foy Lake stuff caught my attention. What startled me was my discovery that the pollen samples reveal that the sylvan Flathead Valley was once mostly a grassy savannah punctuated by clumps of ponderosa pine scattered here and there. Way different than it looks today. The visual got me to thinking about the many times I’ve driven to the summit of the Moiese Bison Range for the commanding views it offers of the Flathead and Clark Fork valleys. I still have trouble rapping my mind around the fact that both valleys were once part of the lakebed that formed Lake Missoula, which covered 2,700 square miles to a depth of about 1,000 feet – about three times the depth of Flathead Lake and about half the water volume held in Lake Michigan. Lake Missoula formed behind a 2,000-foot-tall ice dam on the Clark Fork River near present day Cabinet Gorge, a few miles west of Thompson Falls. When the dam broke some 10,000 years ago it released the largest ice-related water flow for which we can find geologic evidence anywhere else on earth, draining water-filled valleys 200 miles east of Cabinet Gorge. Julia and I have driven the length of the Clark Fork Valley several times and I have written periodically about the Great Missoula Flood – and how the onrushing wall of water that was released when the ice dam broke helped carve the Columbia River Gorge, and how the floodwaters at Portland were 600 feet deep – about 50 feet deeper than the tallest building in downtown Portland. Some of my Oregon friends wish that Portland was still 600 feet underwater, but that’s a story for another day. For a long time, I labored under the mistaken notion that the Missoula Flood was one big flood. Not so. There were many floods– how many we don’t know – but if you are ever sitting in Washington-Grizzly Stadium on a Saturday afternoon and you are looking up at the “M” – because you can’t bear to look down onto the playing field – you will see all the horizontal striations on the hill above the stadium. Each of those visible striations is thought to represent a different water level in Lake Missoula – and thus, perhaps, a different flood. As a distraction, I tried counting these striations during the shellacking UC Davis delivered to the Grizzlies last October. It didn’t work. I gave up at 62 striations. What does this say about all the forests we see today when we drive up Evaro Hill, then down Highway 200 through Ravalli, Dixon, Perma, Paradise, Plains, Thompson Falls and Trout Creek. And what the hell does it say about what was going in Sandpoint, Idaho when the ice dam burst? During the summer months, Julia and I sometimes drive to Sandpoint for lunch because we enjoy the view from the deck at the Edgewater. The view is east toward the mouth of the Clark Fork River. I try to imagine what it must have looked like when that wall of water much taller than any tsunami ever careened across the prehistoric Pend Oreille Lake at several hundred miles an hour. Probably too late to call Mike Garrity or Matthew Koehler about filing a lawsuit against Mother Nature for failing to dot all the I’s and cross all the T’s on her Environmental Impact Statement. Incidentally, I’ve tried to interview both Mr. Garrity and Mr. Koehler with regard to the network of forest collaborative groups that has formed in Montana in recent years. But they won’t return my calls, despite my offer to let them review what I write for accuracy and completeness. No surprise. They also refuse to join in the collaborative process because it doesn’t fit their litigation-driven, taxpayer-funded business model. They and other opportunists and malcontents will continue to sue the Forest Service for as long as Congress allows it, which is both sad and very destructive. We hope to open congressional eyes by introducing them to FIA data and the fabulous research work that is underway at the Forest Service’s research stations. These works answer all the big questions about what’s happening in our forests and why it is happening. Astonishing as it may seem, FIA now has interactive maps that allow anyone with a computer to access county-level data for any of America’s 3,142 counties, boroughs and parishes. You need only move your cursor across your neighborhood and, presto, you have more forest information at your fingertips than you’ve ever had before. When this marvelous system was demonstrated for us by the FIA crew in St. Paul last month Julia and I were able to confirm what we’ve feared for some time. The mountains that rise behind our home in Dalton Gardens, Idaho are ready-to-burn firetraps, a fact thus far not noted in the Idaho Panhandle National Forests updated forest plan. Blessedly, Region 1 is starting to use FIA data in its decadal forest planning work, Merging National Forest System map layers with FIA survey plot and remote sensing data is a very high priority for all who work at the FIA station in Ogden. FIA Ogden is hell-bent on filtering its data bases through NFS protocols, pollenating them with decades of FIA data, improving data quality, predictability and accessibility. This blending of NFS and FIA data sets yields colorful interactive maps at county-level scales that are a mouse click away. These jaw-dropping technological advancements are going to change the nature and substance of the public conversation about the West’s wildfire pandemic, sounding the death knell for serial litigators. Imagine the persuasive power these interactive maps place in the hands of county commissioners, state legislators and collaborative groups here in the West that are working at the project level with the Forest Service. The new interactive mapping system demonstrated for us in St. Paul allows you to select for many different forest values: watersheds, fish and wildlife habitat, timber outputs, forests types, soils, plants, live and dead trees, gross growth, mortality and net growth, carbon accounting and much more. No matter the value you select, the answer is always the same: our national forests and rangelands are in big trouble. But then you already know this. FIA’s meticulously researched and documented data sets reveal much about Montana’s forest past, present and future – and presently our wildfire dominated forest future isn’t looking very bright. The West’s wildfire pandemic teaches some very unsettling lessons about how we got ourselves into this mess and what we must do to get back on track in our national forests. The trail we must now follow into the future is littered with the bodies of warring protagonists who have argued  that “greedy” loggers are to blame or  that “hard-core” environmentalists are to blame. I think there is enough blame to go around. We ought to stop throwing rocks at one another because the blame game doesn’t offer any teaching moments our politically influential urban and metropolitan neighbors will understand. My friend Jack Ward Thomas – who many of you probably knew – figured it was high time we stop wasting our energy walking around the battlefield bayonetting the wounded. I agree. Yes, past logging methods are partly responsible for the dramatic shift in age class distribution we see in the West’s national forests but let us remember that when the Roosevelt and Truman Administrations began to look closely at these forests during World War II, they concluded that they represented the only economic engines the country had that were capable of powering our nation’s speedy transition from wartime to peacetime footing. Well before his April 1945 death, President Roosevelt expressed a fear that our country might fall back into the Great Depression if something wasn’t done to facilitate the fastest possible economic transition. Roosevelt was right to worry because, at war’s end, millions of GI’s streamed home anxious to marry their sweethearts and start families. They needed houses and jobs. In tandem, timber harvested from the West’s great national forests and the fabled GI Bill provided both. There would be no return to prewar breadlines and soup kitchens. Instead, thanks to the Greatest Generation, the Greatest Nation grew at the Greatest Rate in world history. I know this story quite well because my late friend, Dan Goldy, was the one Jebby Davidson, Truman’s Assistant Secretary of the Interior, sent west for a closer look at post-war sawmilling capacity and efficiency. Goldy was also charged with figuring out out what to do about the controversial Cooperative Sustained Yield Act, which would have granted the West’s largest timber landowners’ exclusive access to national forest timber. Lunch bucket Democrats of that era were not about to hand over control of the West’s national forests to a bunch of rich Republican timber beasts, even if those beasts had provided most of the 60-plus billion board feet of timber that were needed to prosecute World War II. To prevent this from happening, Goldy orchestrated the raucous Mohawk hearings in Eugene, Oregon in early 1946 – giving the West’s cantankerous independent lumbermen the very public podium they needed to speak against the Trojan horse that was the cleverly disguised Cooperative Sustained Yield Act. The Montana contingent traveled to Eugene, Oregon under the auspices of the Troy Development Association. It had banded together to battle a similar proposal that would have handed much of the Kootenai National Forest to the old J. Neils Lumber Company at Libby – now part of Weyerhaeuser’s ever-expanding domain. TDA’s spokesman was Leif Erickson, a Helena lawyer and former Montana Supreme Court Justice, whose oratory skills reminded many of the legendary Clarence Darrow. Erickson’s courtroom style stole the show in Eugene. Davidson, who had been chief counsel to the Bonneville Power Administration during its formative years, subsequently killed the Act, which is the only reason Montana has the family-owned sawmills it has today. Having spent a good deal of political capital in the West, breathing life into Franklin Roosevelt’s vision for hydroelectric development of the Columbia River System, Davidson knew something about the region’s politics and its economic potential. Soon after Davidson rendered his decision road-building began in earnest in western national forests that had been pretty much inaccessible when Japan bombed Pearl Harbor in December of 1941. This was why Roosevelt reluctantly leaned so heavily on private timberland owners in the Pacific Northwest and Southeast. Lumbermen in this room have my late friend Leonard Netzorg to thank for making it possible for them to bid for federal timber against the big outfits that attempted to lock them out with their Cooperative Sustained Yield Act. It was Leonard who wrote the framework for the infamous Reciprocal Rights of Way agreements that put private timberland owners on notice that they could not use Forest Service or BLM roads to access their timber unless they gave lumbermen who did not own timber the right to use their privately-owned roads to access federal timber sales they wished to bid. Now we turn to environmentalists and the second half of the question I posed a few minutes ago. Are environmentalists partly to blame for the wildfire pandemic we face in the West today? They absolutely are, but the trail here has many more twists and turns in it than the more direct route independent lumbermen have followed since 1945. A little over a year ago, I was invited to spend a morning with students enrolled in a graduate level forest policy class at the University of Idaho. My remarks, which I titled Felt Necessities: Engines of Forest Policy, was so well received that I decided to dig deeper into the topic. The result is a series you can find on our Evergreen website that traces the history of our nation’s felt necessities as they concern forests and forest conservation. The story here is too long to tell this morning but there are now nine segments in my Felt Necessities series on our website. I am at the point where Dan Goldy and Jebby Davidson deep-six David Mason’s plan for handing control of the West’s national forests over to its largest timberland owners, so I have three or four installments still to write. I will probably stop with the June 1990 listing of the northern spotted owl because the rest of the story still makes me angry. It made Jack Ward Thomas angry too. I know this because he and I talked about it many times at his home in Corvallis, Montana. Jack was a great conversationalist and, while we quarreled occasionally, we remained good friends until his death. I once asked Jack if he could tell me what the Forest Service’s management objective had been during his time as Chief. He paused for maybe a minute, which was unusual for Jack, before advising me that the goal had been to conserve late succession species. “So were you successful,” I asked. 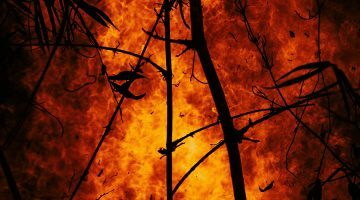 “Hell no,” he quickly replied, knowing that he and I both understood what wildfires were doing to all kinds of forest habitat, including late succession environs used by many species including the northern spotted owl, which turns out to be more of a habitat generalist than many early owl researchers believed. Some think I should publish Felt Necessities in book form. Maybe I will. Meantime, if you can appreciate the genius of what Justice Holmes said about our society’s felt necessities you will also appreciate a conservationist’s spin on Holmes, observation from my friend Alan Houston. Alan is a PhD wildlife biologist. He runs the forestry program at the Ames Plantation at Grand Junction, Tennessee. If you hunt birds with field dogs, you have heard of the national field trials that the Ames family hosts annually at Grand Junction. When we leave forests to nature, as so many people today seem to want to do, we get whatever Nature serves up, which can be pretty devastating at times, but with forestry we have options and a degree of predictability not found in Nature. Now we are living in a new and very different realm – one in which feelings and hash tags often trump facts, and now you can begin to appreciate the complexity of the social and cultural challenges we face in our effort to find public consensus in our quest to pull the West’s great national forests back from the brink of ecological collapse, to breathe new life into stagnating natural processes that drive forest resiliency. And while we are doing all of this, add in these observations shared with me many years ago by yet another Montana writer, Alston Chase, whose book, Playing God in Yellowstone, is very instructive for anyone wanting to understand the many and stark differences between conservation and hard-core environmentalism. The lesson in ‘Playing God’ is that there is no such thing as leaving nature alone. People are part of Creation. We do not have the option of choosing not to be stewards of the land. We must master the art and science of good stewardship. Many environmentalists do not understand that the only way to preserve nature is to manage nature. Environmentalism increasingly reflects urban perspectives. As people move to cities, they become infatuated with fantasies of land untouched by humans. This demographic shift is revealed through ongoing debates about endangered species, grazing, water rights, private property, mining and logging. And it is partly a healthy trend. But this urbanization of environmental values also signals the loss of a rural way of life and the disappearance of hands on experience with nature. So the irony: as popular concern for preservation increases, public understanding about how to achieve it declines. Two trails – two futures – lay before us. One is green and lovely and the other is black and ugly. It is hard for me to believe our society and its federally elected representatives will choose the trail leading to black and ugly but if we don’t double and redouble the forestry education effort that most lumbermen believe is a waste of time and money this is very likely the choice they will make. At Evergreen, Julia and I intend to do everything in our power to prevent this from happening. What’s wrong in our national forests is fixable. We have the science, technology, local knowledge and skills to fix it. What is missing is political will. Unfortunately, Nature isn’t waiting for us to reconcile our feelings. The housecleaning is underway and it isn’t pretty. If you haven’t read the San Francisco Chronicle’s chronological reconstruction of the frantic 911 calls made during last fall’s Camp Fire, I suggest you do so. They are very sobering. 86 dead. Paradise burned to the ground. Two months earlier a young wildland firefighter lost his life in the Carr Fire near Redding, California when a wind-driven fire-whirl snatched his speeding pickup off a paved road and tossed it a hundred yards into flaming hardwoods. To this lyric, I will add that we best saddle up and ride now or we won’t get there in time. Thank you.